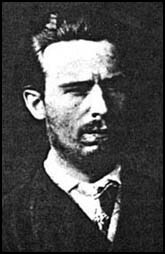 Sergey Gennadiyevich Nechayev (Russian: Серге́й Генна́диевич Неча́ев) (2 October 1847 – 21 November or 3 December 1882) was a Russian communist revolutionary associated with the nihilist movement and known for his single-minded pursuit of revolution by any means necessary, including terrorism. He was the author of the radical Catechism of a Revolutionary. Nechayev fled Russia in 1869 after having been involved in the murder of a former comrade. Complicated relationships with fellow revolutionaries caused him to be expelled from the International Workingmen's Association. Arrested in Switzerland in 1872, he was sent back to Russia, received a twenty-year sentence and died in prison. The character Pyotr Verkhovensky in Fyodor Dostoevsky's anti-nihilistic novel Demons is based on Nechayev. Nechayev was born in Ivanovo, then a small textile town, to poor parents—his father was a waiter and sign painter. His mother died when he was eight. His father remarried and had two more sons. They lived in a three-room house with his two sisters and grandparents. They were ex-serfs who had moved to Ivanovo. He had already developed an awareness of social inequality and a resentment of the local nobility in his youth. At the age of 10, he had learned his father's trades—waiting at banquets and painting signs. His father got him a job as an errand boy in a factory, but he refused the servant's job. His family paid for good tutors who taught him Latin, German, French, history, maths and rhetoric. Aged 18, Nechayev moved to Moscow, where he worked for the historian Mikhael Pogodin. A year later, he moved to Saint Petersburg, passed a teacher's exam and began teaching at a parish school. From September 1868, Nechayev attended lectures at the Saint Petersburg University as an auditor (he was never enrolled) and became acquainted with the subversive Russian literature of the Decembrists, the Petrashevsky Circle and Mikhail Bakunin among others as well as the growing student unrest at the university. Nechaev was even said to have slept on bare wood and lived on black bread in imitation of Rakhmetov, the ascetic revolutionary in Nikolay Chernyshevsky's novel What Is to Be Done?. Inspired by the failed attempt on the Tsar's life by Dmitry Karakozov, Nechayev participated in student activism in 1868–1869, leading a radical minority with Pyotr Tkachev and others. Nechayev took part in devising this student movement's "Program of revolutionary activities" which stated later a social revolution as its ultimate goal. The program also suggested ways for creating a revolutionary organization and conducting subversive activities. In particular, the program envisioned composition of the Catechism of a Revolutionary, for which Nechayev would become famous. In December 1868, Nechayev met Vera Zasulich (who would make an assassination attempt on General Fyodor Trepov, governor of Saint Petersburg in 1878) at a teachers' meeting. He asked her to come to his school where he held candlelit readings of revolutionary tracts. He would place pictures of Maximilien Robespierre and Louis Antoine de Saint-Just on the table while reading. At these meetings, he plotted to assassinate Tsar Alexander II on the 9th anniversary of serfdom's abolition. The last of these student meetings occurred on 28 January 1869, where Nechayev presented a petition calling for freedom of assembly for students. Two days later, he handed it to the police, intending to radicalize the students through prison and exile. In years of unceasing labor. The thirst to improve man's fate. Bakunin saw in Nechayev the authentic voice of Russian youth which he regarded as "the most revolutionary in the world". He would hold onto this idealised vision long after his association with Nechayev became damaging to him. Nechayev, Bakunin and Ogarev organized a propaganda campaign of subversive material to be sent to Russia, financed by Ogarev from the so-called Bakhmetiev Fund which had been intended for subsidizing their own revolutionary activities. Alexander Herzen disliked Nechayev's fanaticism and strongly opposed the campaign, believing Nechayev was influencing Bakunin toward more extreme rhetoric. However, Herzen relented to hand over much of the fund to Nechayev which he was to take to Russia to mobilise support for the revolution. Nechayev had a list of 387 people who were sent 560 parcels of leaflets for distribution April–August 1869. The idea was that the activists would be caught, punished and radicalized. Amongst these people was Zasulich, who got five years exile because of a crudely coded letter sent by Nechayev. A revolutionary is a doomed man. He has no private interests, no affairs, sentiments, ties, property nor even a name of his own. His entire being is devoured by one purpose, one thought, one passion – the revolution. Heart and soul, not merely by word but by deed, he has severed every link with the social order and with the entire civilized world; with the laws, good manners, conventions, and morality of that world. He is its merciless enemy and continues to inhabit it with only one purpose – to destroy it. A revolutionary "must infiltrate all social formations including the police. He must exploit rich and influential people, subordinating them to himself. He must aggravate the miseries of the common people, so as to exhaust their patience and incite them to rebel. And, finally, he must ally himself with the savage word of the violent criminal, the only true revolutionary in Russia". The book was to influence generations of radicals and was re-published by the Black Panther Party in 1969, one hundred years after its original publication. It also influenced the formation of the militant Red Brigades in Italy the same year. Nechayev began to tell me his plans for carrying out a revolution in Russia in the near future. I felt terrible: it was really painful for me to say "That's unlikely," "I don't know about that". I could see that he was very serious, that this was no idle chatter about revolution. He could and would act – wasn't he the ringleader of the students? [...] I could imagine no greater pleasure than serving the revolution. I had dared only to dream of it, and yet now he was saying that he wanted to recruit me. [...] And what did I know of "the people"? I knew only the house serfs of Biakolovo and the members of my weaving collective, while he was himself a worker by birth. Many were impressed by the young proletarian and joined the group. However, the already fanatical Nechayev appeared to be becoming more distrustful of the people around him, even denouncing Bakunin as doctrinaire, "idly running off at the mouth and on paper". One Narodnaya Rasprava member, I. I. Ivanov, disagreed with Nechayev about the distribution of propaganda and left the group. On 21 November 1869, Nechayev and several comrades beat, strangled and shot Ivanov, hiding the body in a lake through a hole in the ice. The body was soon found and some of his colleagues arrested, but Nechayev eluded capture and in late November left for Saint Petersburg, where he tried to continue his activities to create a clandestine society. On 15 December 1869, he fled the country, heading back to Geneva. This incident was fictionalised by writer Fyodor Dostoevsky in his anti-nihilistic novel Demons (published three years later) in which the character Pyotr Stepanovich Verkhovensky is based on Nechayev. Bakunin and Ogarev embraced Nechayev on his return to Switzerland in January 1870, with Bakunin writing: "I so jumped for joy that I nearly smashed the ceiling with my old head!". Soon after their reunion, Herzen died (21 January 1870) and a large fund from his personal wealth became available to Nechayev to continue his political activities. Nechayev issued a number of proclamations aimed at different strata of the Russian population. Together with Ogarev, he published the Kolokol magazine (April–May, 1870, issues 1 to 6). In his article "The Fundamentals of the Future Social System" (Glavnyye osnovy budushchego obshchestvennogo stroya), published in the People's Reprisal (1870, no. 2), Nechayev shared his vision of a communist system which Karl Marx and Friedrich Engels would later call barracks communism. According to your way of thinking, you are nearer to the Jesuits than to us. You are a fanatic. This is your enormous and peculiar strength. But at the same time this is your blindness, and blindness is a great and fatal weakness; blind energy errs and stumbles, and the more powerful it is, the more inevitable and serious are the blunders. You suffer from an enormous lack of the critical sense without which it is impossible to evaluate people and situations, and to reconcile means with ends. [...] As a consequence of these considerations and in spite of all that has happened between us, I would wish not only to remain allied with you, but to make this union even closer and firmer, on condition that you will change the system entirely and will make mutual trust, sincerity and truth the foundation of our future relations. Otherwise the break between us is inevitable. Nevertheless, Bakunin began warning friends about Nechayev's behaviour. In September 1870, Nechayev published an issue of the Commune magazine in London as the Second French Empire of Napoleon III collapsed. Hiding from the Tsarist police. he later went underground in Paris and then in Zürich. He also kept in touch with the Polish Blanquists such as Caspar Turski and others. In September 1872, Karl Marx produced the threatening letter (which Nechayev had written to the publisher) at the Hague Congress of the International at which Bakunin was also expelled from the organisation. On 14 August 1872, Nechayev was arrested in Zürich and handed over to the Russian police. He was found guilty on 8 January 1873 and sentenced to twenty years of katorga (hard labor) for killing Ivanov. While locked up in a ravelin of the Peter and Paul Fortress, Nechayev managed to win over his guards with the strength of his convictions and by the late 1870s was using them to pass on correspondence with revolutionaries on the outside. In December 1880, Nechayev established contact with the Executive Committee of the People's Will (Narodnaya Volya) and proposed a plan for his own escape. However, he abandoned the plan due to his unwillingness to distract the efforts of the members of Narodnaya Volya from attempting to assassinate the Tsar Alexander II which they achieved only in March 1881. Vera Zasulich, who ten years earlier had been among those investigated for Ivanov's murder, heard that in 1877 the head of the Saint Petersburg police General Trepov had ordered the flogging of Aleksei Bogolyubov, a young political prisoner. Though not a follower of Nechayev, she felt outraged at his mistreatment and at the plight of other political prisoners. On 5 February, she walked into Trepov's office and shot and wounded him. In an indication of the popular political feeling of the time, a jury found her not guilty on the grounds that she had acted out of noble intent. Nechayev's theories had a major influence on other Russian revolutionaries, like Pyotr Tkachev and Vladimir Lenin. He was the first to bring the theme of the professional revolutionary in Russia. Lenin's brother Aleksandr Ulyanov was part of an organization which based its program in nechayev's. His other theories on how a socialist state would function, outlined in the "Fundamental Thesis" and the "The Fundamentals of the Future Social System" among others, were identical to that of the Soviet Union and other Marxist–Leninist states. For instance, Lenin stated many times that Nechayev was a "Titan of the revolution" and that all of the communist revolutionaries most "read Nechayev". Many critics inside and out of the Soviet Union lebelled his version of communism the one that was taking place in the Soviet Union itself, with Soviet politicians after the Stalin's era admitting this themselves many times. He also influenced later generations of Russian revolutionary nihilists. He was rehabilitated during stalin's time. ^ Maegd-Soëp, Carolina (1990). Trifonov and the Drama of the Russian Intelligentsia. Ghent State University, Russian Institute. p. 79. ISBN 90-73139-04-X. ^ Nechayev, Sergey. "Катехизис революционера" (1869). Publisher's preface from Rudnitskaya, El L., ed. (1997). Revolyutsionnyy radikalizm v Rossii: vek devyatnadtsatyy. Dokumental'naya publikatsiya. Moscow: Arkheohrafycheskyy tsentr. ^ Siljak, Ana (2009). Angel of Vengeance. p. 90. ^ Drozd, Andrew Michael (2012). Chernyshevskii's What is to be Done? : A Reevaluation. p. 115. ^ Siljak, Ana (2009). Angel of Vengeance. p. 93. ^ Siljak, Ana (2009). Angel of Vengeance. p. 97. ^ Siljak, Ana (2009). Angel of Vengeance. p. 98. ^ Siljak, Ana (2009). Angel of Vengeance. p. 101. ^ Siljak, Ana (2009). Angel of Vengeance. p. 111. ^ a b Radzinsky, Edvard (1997). Stalin: The First In-depth Biography Based on Explosive New Documents from Russia's Secret Archives. ISBN 0-385-47954-9. ^ Siljak, Ana (2009). Angel of Vengeance. p. 120. ^ Bakunin, Mikhail. "M. Bakunin to Sergey Nechayev". In Confino, Michael (1974). Daughter of a Revolutionary: Natalie Herzen and the Bakunin-Nechayev Circle. London: Alcove Press. ^ Wheen, Francis (1999). Karl Marx pp. 346–347. ^ Clellan, Woodford Mc. "Nechaevshchina: An Unknown Chapter". Slavic Review. 32 (3): 546–553. doi:10.2307/2495409. ISSN 0037-6779. ^ Mayer, Robert (1993). "Lenin and the Concept of the Professional Revolutionary". History of Political Thought. 14 (2): 249–263. ISSN 0143-781X. ^ "The Influences of Chernyshevsky, Tkachev, and Nechaev on the political thought of V.I. Lenin". ResearchGate. Retrieved 25 March 2019. ^ "Сергей Нечаев: «темный чуланчик» русской революции". МирТесен - рекомендательная социальная сеть (in Russian). Retrieved 25 March 2019. ^ Kimball, Alan. "The First International and the Russian Obshchina". Slavic Review. 32 (3): 491–514. doi:10.2307/2495406. ISSN 0037-6779. ^ Read, Cristopher (2004). "Lenin: A Revolutionary Life" (PDF). Retrieved 25 March 2019. Robynski (1994). Nechaev and Bakunin: Left Libertarianism's Lavender Lineage. Northcote, Vic: Autonomous Tendency. Shively, Charley; Dynes, Wayne R., ed. (1990). "Anarchism". Encyclopedia of Homosexuality. New York: Garland. p. 51. Hodges, Andrew; Hutter, David. (1977). With Downcast Gays. Pink Triangle Press. Payne, Robert (1967). The Fortress. New York. Pomper, Phillip (Winter 1976). "Bakunin, Nechaev and the "Catechism of a Revolutionary": The Case for Joint Authorship". Canadian Slavic Studies. pp. 534–551. Bakunin rebukes Nechayev and his Chatechism for vanguardism. Avrich, Paul. "Bakunin and Nechaev". Freedom Press. ISBN 0-900384-09-3. Coetzee, J. M. (1994). The Master of Petersburg. Secker and Warburg. Ambler, Eric. (1981). The Care of Time. New York. Ambler's last novel uses a purported memoir by Nechayev as a central plot device. Prawdin, Michael (1961). The Unmentionable Nechaev: A Key to Bolshevism. London: George Allen & Unwin. Argues that Nechaev was one of the greatest influences on Lenin. Semprún, Jorge (1987). Netchaïev est de retour. A suspense novel in which one of the central characters uses Nechaev as a nom de guerre. Payne, Pierre (1975). The Corrupt Society. New York: Praeger. p. 202. ISBN 0-275-51020-4. .
Hyams, Edward (1975). Terrorists and Terrorism. ISBN 978-046-00786-3-4. Nechayev, Sergey (1869). The Revolutionary Catechism.